We have published our first annual gender pay report. All public sector employers with 250 or more employees are required to publish information about gender pay gaps. It highlights our workforce, the numbers of police staff and police officers we employ, and also the gender balance within our organisation. 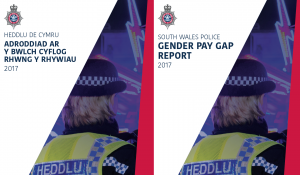 Our report shows that men and women within South Wales Police are not being paid differently for equal work, however there are a higher percentage of females working within the lower grades for police staff, and there are fewer female police officers as a whole. Our Delivery Plan for Female Recruitment, Progression and Retention highlights the work that has been undertaken to encourage women to join us and progress; promote a supportive working environment; and promote women’s health and wellbeing. We plan to publish this report every year.